Glen Rock, Pennsylvania | January 10, 2011 | Rev. 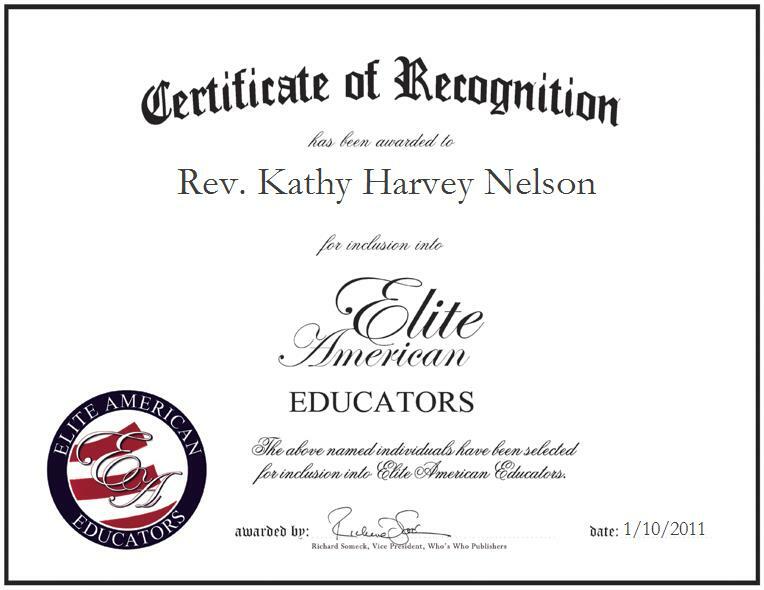 Kathy H. Nelson, M.Div., coordinator for the continuing education department at Lancaster Theological Seminary, has been recognized by Elite American Educators for demonstrating dedication, leadership and excellence in continuing education. With over t12 years of professional experience, Rev. Nelson organizes the continuing education programs, conducts religious services, events and programs, teaches lessons on the Bible, conducts counseling, performs pastoral duties, and resources clergy, laity and students through continuing education. As the coordinator of the continuing education program, Rev. Nelson is able to see others grow and accomplish more. Attributing her success to her ability to work well with others, Rev. Nelson has established an essential network of professionals that has aided in her success as well as a distinctive style of working, integrity and dependability. Rev. Nelson earned a Master of Divinity from Lancaster Theological Seminary in 2003, she also holds a Bachelor of Science in therapeutic recreation from York College of Pennsylvania, earned in 1978. Rev. Nelson is a certified spiritual director and a member of Spiritual Directors International. For more information on Lancaster Theological Seminary, please visit http://www.lancasterseminary.edu.